Apple has set up an online survey to find out more about how recent buyers of Apple TV make use of their box and what they do and don't like about it in an effort to improve the system. 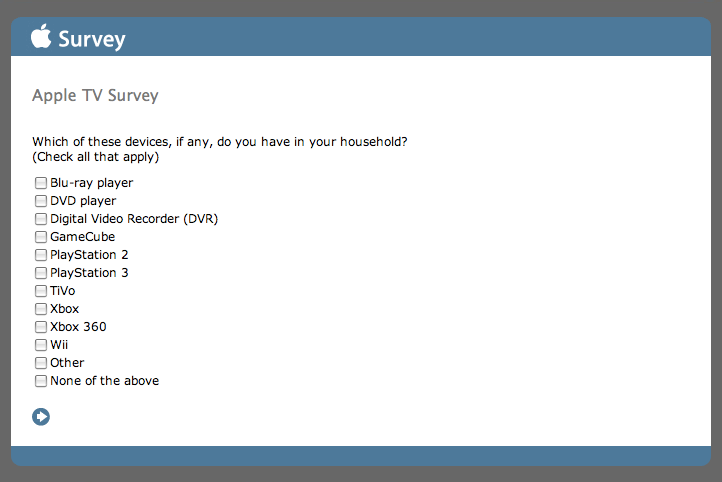 The online survey asks for demographic information, then asks users about how frequently the use Apple TV for various tasks, from renting movies to viewing photos to using it for home movies and with MobileMe Gallery. Apple also asks users "what percentage of the content on your Apple TV comes from the following sources: iTunes Store; home videos (camcorder); short clips from the internet such as YouTube, email, downloads; movies or TV shows from the internet (Peer 2 peer, Bittorrent, other sources for downloading); video from your own DVD collection; or other sources." That indicates the company has its eye on the shadowy market for ripped DVDs, both those created by users themselves from their own DVDs via a tool such as Handbrake (a potentially legitimate practice that the studios still oppose due to piracy fears), and the wholesale piracy of content obtained illicitly over the Internet. Apple also asks users what type (LCD, CRT, Plasma) of display they use with Apple TV, what screen size, and the best resolution supported (480i SDTV, 480p EDTV, 720p HDTV, or 1080p HDTV), what type of audio system they use (TV speakers, 2 speakers, 2.1, 4.1, 5.1 or 7.1 surround sound speakers), whether they use the supplied Apple Remote or if they have programed a universal remote to work with the system, and whether users also own an iPhone or iPod touch, both of which can be used to control Apple TV using the company's free Remote software. Apple also specifically asks if users have downloaded the Remote software to use with Apple TV. The survey also asks how many desktop and notebook computers the user has, and how many are Macs versus Windows PCs. It also asks if the user has paired Apple TV with iTunes on their computer, what type of system it is, and how many gigabytes of data they keep in sync with iTunes. One freeform question asks "If you could change one thing about your Apple TV, what would that be?" Another asks respondents to check off all of the other devices they own, including a Blu-ray or DVD player; Tivo or other DVR; GameCube or Wii; PlayStation 2 or 3; and Xbox or Xbox 360. Apple also asks how users how many movies they rent per month, and where they obtain them, providing Amazon, Apple TV, Blockbuster online and store locations, Cable, iTunes, Netflix DVD rental by mail, the Netflix streaming box, Vudo, Xbox 360 Live, the local video store, other Internet rentals, or "mail rental order." The survey then asks how many movies the user buys per month, and asks where they are bought: WalMart, Target, local video store, other physical retail store, Amazon, iTunes, or some other online store. The survey should provide useful information on what users want and how they are currently using Apple TV, enabling the company to improve the device and its software, as well as its marketing. Apple currently does very little promotion of the device, leaving it almost entirely positioned as a way to watch iTunes movie rentals, TV shows, and photos. The company's website only makes relatively brief mention of the system's ability to play free podcasts and present home videos and albums from Flickr and the company's own MobileMe Gallery service. Many observers have stated that the success of the iPod was in large part due to its ability to work with content users already had, particularly the tight integration with iTunes' ability to rip CDs. Apple TV lacks any ability to play back DVDs remotely, and requires a more complex, do-it-yourself process to transcode DVDs into playable files. That might change if the company could convince labels to allow iTunes to rip DVDs (or play them remotely using the company's Remote Disc drive sharing technology), but any progress on that front has been complicated by licensing terms and the much longer and complex task of ripping DVD data, relative to the much simpler task of copying and compressing the unencrypted audio files from CDs. Studios have acted to include a mobile version of movies that now appears on many new DVD titles, however. Analysts also jumped on Apple's recent revelation that its December quarter sales of the device were up three times over sales a year ago, and have tried to suggest a number of ways the company could apply that mounting interest in future products. Commonly offered ideas include Bernstein Research analyst Toni Sacconaghi's recommendation to turn the media player into a DVR and cable box, and the recent report by Piper Jaffray analyst Gene Munster that suggests Apple might want to enter the TV set business. Fortune cited a report in RoughlyDrafted Magazine that recommended Apple open the box to third party developers similar to the iPhone App Store, offering an SDK for building mini games, interactive web widgets, and productivity apps tied into online services such as iWork.com, all navigated using a handheld iPhone or iPod touch. It also suggested improved promotion free content such as Internet radio, podcasts, and iTunes U.